Creating applications for the myriad versions and varieties of mobile phone platforms on the market can be daunting to even the most seasoned developer. This authoritative guide is written in such as way that it takes your existing skills and experience and uses that background as a solid foundation for developing applications that cross over between platforms, thereby freeing you from having to learn a new platform from scratch each time. Concise explanations walk you through the tools and patterns for developing for all the mobile platforms while detailed steps walk you through setting up your development environment for each platform. Professional Mobile Cross Platform Development shows you how to best exploit the growth in mobile platforms, with a minimum of hassle. Jeff McWherter is the Director of Development at Gravity Works Design and Development. He is a founding member and current Vice President for the Greater Lansing Users for .NET. Scott Gowell is a senior developer at Gravity Works Design and Development. 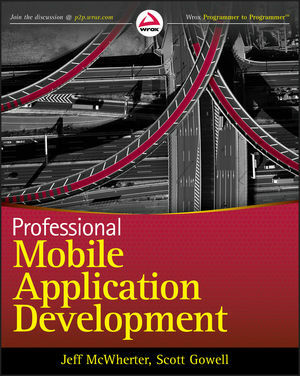 He develops mobile applications for clients and speaks at local user groups.